You are always on the go and so is your target audience -- talented candidates. Over 55% of LinkedIn members access our site from their mobile devices to check InMails, update their profiles, share articles. 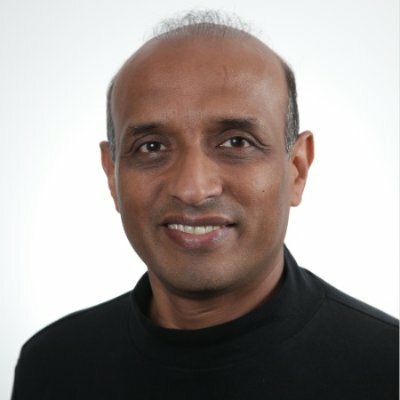 Accordingly, you can no longer afford to be tethered to your desk to view messages from that highly sought-after prospect or wait to get to a desktop computer to forward a candidate profile to your hiring manager. Days of 9-to-5 recruiting are long gone – especially if you are trying to attract and place candidates in today’s competitive market. To address this need and help you do your job anytime from anywhere, we built a LinkedIn Recruiter mobile app for both Apple and Android devices. As with any mobile app, the objective of the app is to deliver key features that are most amenable for on-the-go recruiting/sourcing activities (such as viewing InMails, sending a quick note, getting notified or doing a quick profile search) while holding back other functionalities (such as creating a new project, running a Boolean search) to be accessible from a desktop. 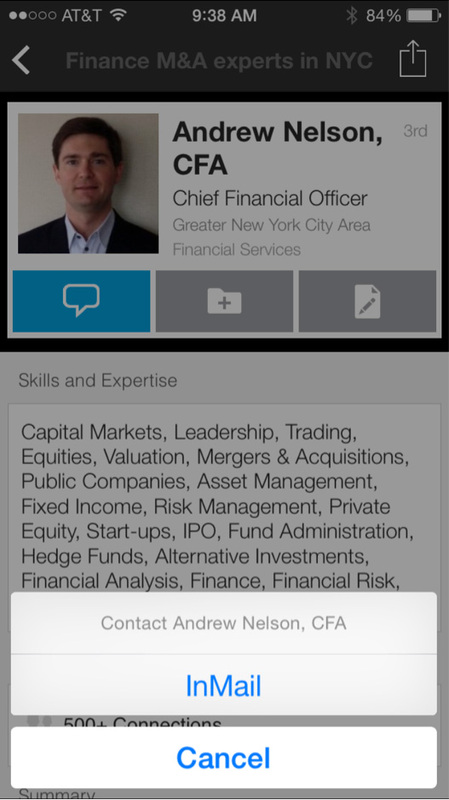 When you long into the mobile app you will see a stream of updates on candidates you follow, just like you would on your LinkedIn Recruiter desktop. For example, if a candidate edits their profile or if someone on your recruiting team takes an action on a candidate, you’ll see it in your updates stream. Updates will also highlight new applicants for jobs you may have posted, new results for saved searches and new hiring manager reviews. This way, you can stay updated on your recruiting activities wherever you are. 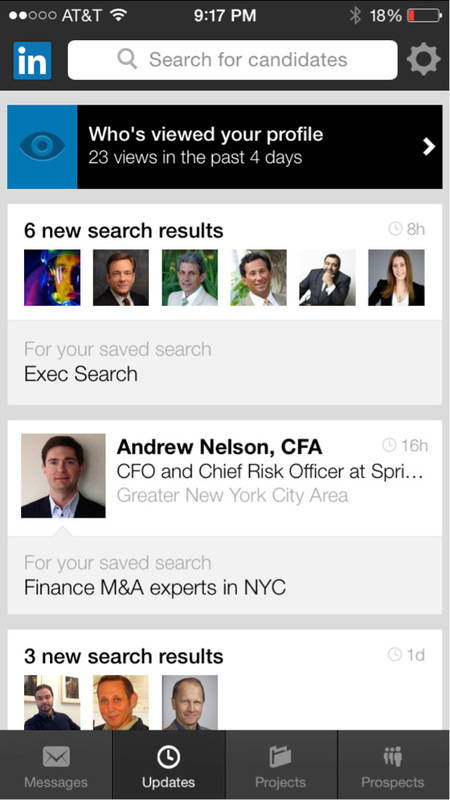 Recruiter Mobile also gives you fast and easy access to candidate profiles. When you open a candidate profile, you will get a quick summary of current role — name, headline, location and industry. The Team Activity section lets you know if anyone on your recruiting team has already evaluated the candidate for another job. Below that, you will see the regular LinkedIn.com profile sections giving extra details on the person’s professional background. Passive candidates are hard enough to attract, so the last thing you want to do is let a lot of time slip by before you get back to them. 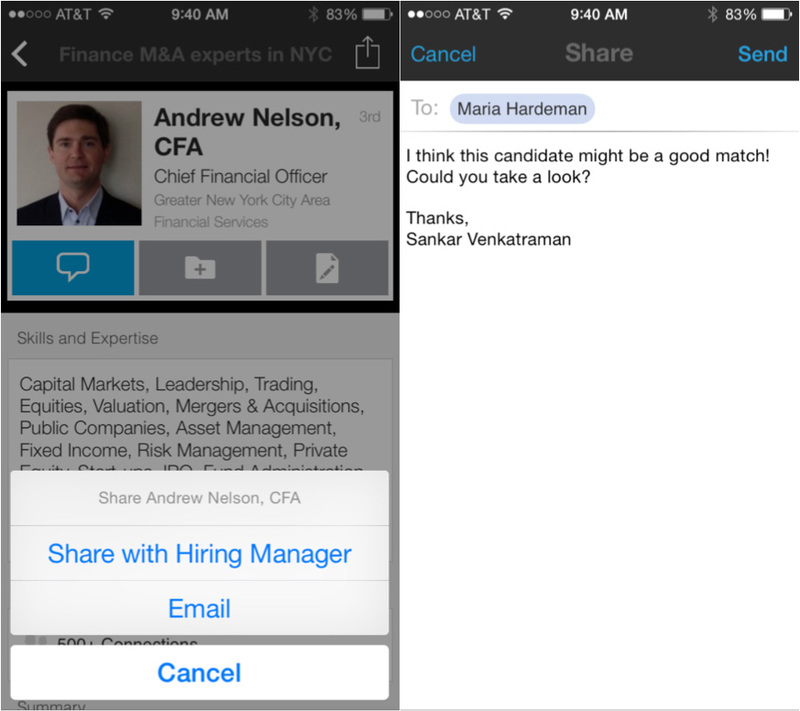 With the LinkedIn Recruiter app’s mobile-friendly messaging, you can InMail candidates anytime from your phone. To make it convenient for you, we also provide the templates that are normally available to you on your desktop. And when a candidate replies, you’ll immediately receive a push notification so you don’t miss their message. The hiring manager review process is also simplified on mobile to improve communications between recruiters and hiring managers. The hiring manager opens his/her inbox, can vote “Great” or “Not a fit” and writes a quick comment to better inform the recruiter. As you can see in the examples provided, the app is really built for you to do less-involved work quickly, such as responding to a candidate, reviewing profiles while on the go or sharing a prospect with a colleague or a hiring manager. Checkout this short video to see what else the app can do for you. Don’t have the app on your smart phone yet? 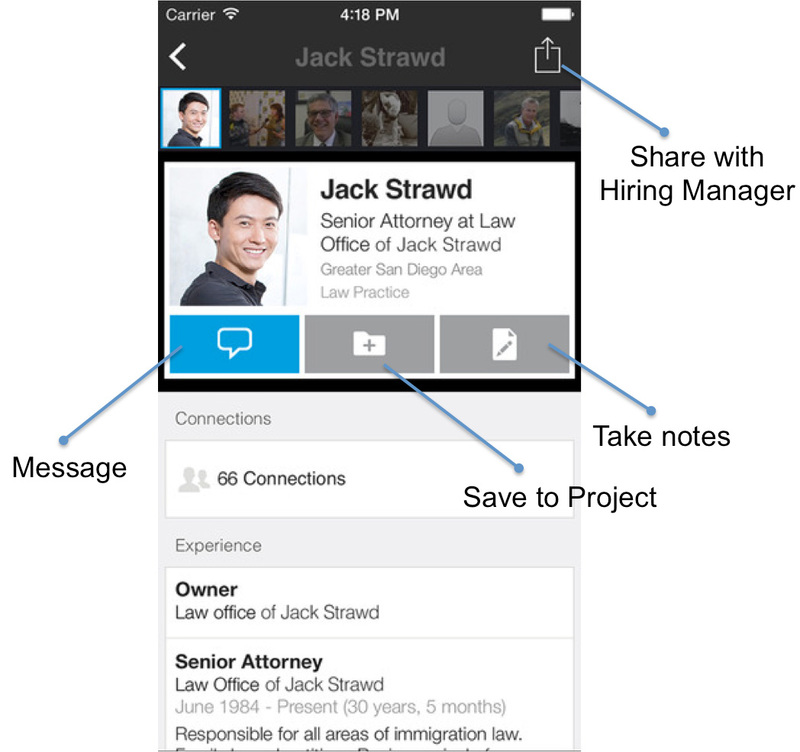 The app is free for anyone with a LinkedIn Recruiter license -- download it today from the Appstore or Google Play.